The Lake District, also known as The Lakes or Lakeland, is a rural area in north west England. 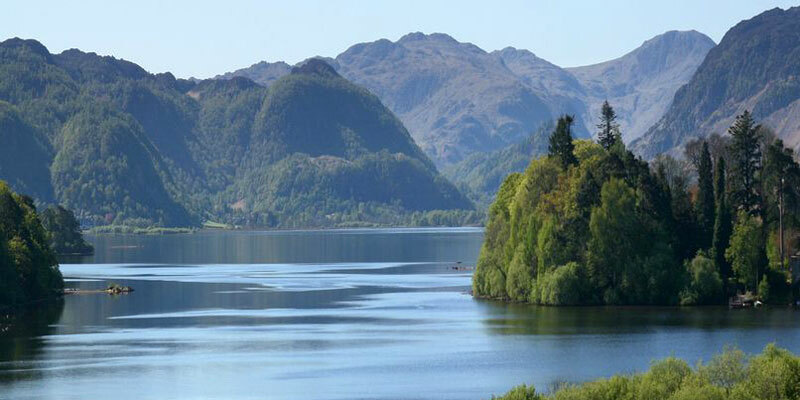 A popular holiday destination with a great range of holiday accommodation, it is famous for its lakes and its mountains (or fells), and also its associations with the early 19th century poetry and writings of William Wordsworth and the Lake Poets. It was also the inspiration for Beatrix Potter. The main towns include Windermere and Bowness, Ambleside, Grasmere, Keswick, Cockermouth, Carlisle, Workington, Whitehaven, Maryport, Ulverston and Kendal. In addition there are a host of small villages such as Patterdale, Glenridding, Elterwater and Hawkshead which provide ideal bases for holiday makers. Only one lake in the National Park has the word 'Lake' in its name, namely Bassenthwaite Lake. All the others such as Windermere, Coniston Water, Ullswater and Buttermere use other forms, with 'mere' being particularly common. Alfred Wainwright immortalised the fells and dales of the lakes with his series of pictorial guides - a must for walkers, fell runners, mountain bikers and climbers. Cumbria also has spectacular coastline and beaches and is an ideal holiday destination for families. There are many other spectacular hills to be walked, including Place Fell. The Lake District a must for all outdoor enthusiasts, whatever their experience and aptitude! As you would expect it offers the full range of holiday accommodation, from five star luxury hotels, to quaint bed and breakfasts and fabulous self-catering holiday cottages. There are also many excellent campsites and caravan parks. There is a huge range of attractions, places to eat and other activities to suit all tastes.